CARACAS, Venezuela (CNN) -- Venezuelan President Hugo Chavez will celebrate 10 years in power next week by holding a rare summit with some of his closest leftist allies in Latin America. Venezuelans will be asked in February whether or not Hugo Chavze should be allowed to run for a third term. Attending will be leaders or representatives from a group called the Bolivarian Alternative for the Peoples of Our Americas, better known as ALBA. Chavez and his allies started the group a few years ago in attempt, they said, to counterbalance United States influence in Latin America. 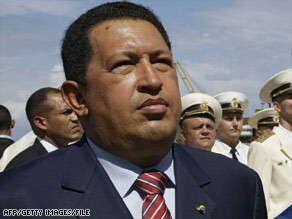 Chavez announced the gathering Monday on state-run Radio Nacional de Venezuela, commonly called RNV. He called it "an extraordinary summit of ALBA ." Bolivian President Evo Morales, Nicaraguan President Daniel Ortega, Cuban Vice President Carlos Lage, Honduran President Manuel Zelaya and Dominica Prime Minister Roosevelt Skerrit will attend, RNV said on its Web site. Cuban President Raul Castro will not be there because he is on a trip to Asia, El Universal newspaper said. At ALBA's latest meeting in Caracas in November, the leaders began discussion on the creation of common currency throughout the region, El Universal said. Officials talked about creating a currency called a "Sucre," a Spanish acronym for "Unified System of Regional Compensation." Sucre is also the constitutional capital of Bolivia, where the Supreme Court meets, and the main currency in Ecuador. A meeting scheduled for mid-December to discuss regional economic integration was canceled, the newspaper said. Chavez was elected president of Venezuela in 1998, six years after a failed coup attempt to depose then-President Carlos Andres Perez. He was sworn in on February 2, 1999. He was re-elected in a special election in July 2000 after a new constitution was adopted and again in 2006. The new constitution limits him to two consecutive six-year terms, but the Venezuelan congress recently approved a referendum for February 15 that would allow Chavez to run for a third term in 2012. Venezuelans narrowly rejected a similar measure in a December 2007 referendum. Chavez has been campaigning hard in favor of the referendum. Bolivians approved a new constitution Sunday that will allow that nation's president, Morales, to run for another five-year term in December.